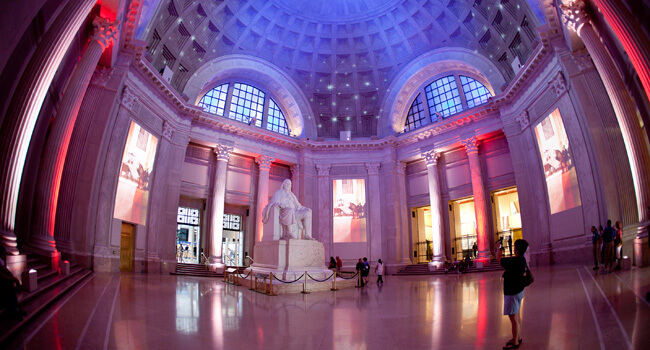 The Benjamin Franklin National Memorial sits in the grand rotunda of The Franklin Institute. In Philadelphia, you can choose from dozens of unique, affordable and convenient venues that will give your meeting, dinner or special event that extra zip. From a gala set amidst some of the world’s greatest art to a meeting with a view of zebras, Philadelphia’s outstanding venues will make your event one for the record books. Be sure to see our searchable Venues guide to find the ideal auditorium, banquet hall, classroom or reception hall to fit your group. Impress your colleagues by hosting a meeting in historic, centuries-old Carpenters’ Hall, location of the First Continental Congress in 1774. Inspire attendees with a brainstorm session held at The Franklin Institute. Meet among 100 interactive exhibits and dramatic multimedia presentations at the National Constitution Center or the National Museum of American Jewish History. Both offer great scenic views of Independence Mall. Entertain in style surrounded by the renowned collections at one of Philadelphia’s prestigious museums: the Pennsylvania Academy of the Fine Arts, Philadelphia Museum of Art or the African American Museum in Philadelphia. Conduct team-building activities at Temple University’s Liacouras Center, Lincoln Financial Field, Citizens Bank Park or the Battleship New Jersey. Sharks, hippopotamuses, birds and sea life converge on the Delaware River Waterfront. Offering four lovely galleries, an auditorium and outside tent space, the museum’s amazing exhibitions provide a unique and elegant backdrop for any event. Enjoy Iron Chef Jose Garces’ famed Andalusian tapas in a sultry, rustic-chic setting. Philadelphia’s premiere special events venue located directly off the Avenue of the Arts, where cultural sophistication and diversity meet the richness of tradition and history. European ambiance, breathtaking, incredible cuisine, accommodates 150 to 1200 + Premier Facility. Space available on the deck of the most decorated warship in U.S. maritime history. Philadelphia’s only authentic German Bierhall and Restaurant. Offering the region’s best German Beer selection (30 taps, 85 bottles) as well as an extensive schnapps list. Chef Jeremy Nolen’s menu serves up traditional and new German cooking featuring house made sausages and cured meats to spätzle and Sauerbraten. Meeting place of the first Continental Congress in 1774. Wilmington, Delaware’s largest venue for meetings, tradeshows, convention and celebrations. Tastefully decorated meeting space for intimate to grand corporate events. Step inside the world of 19th century medicine at the world renown Mutter Museum. Dave Buster’s- Eat, Drink, Play and More! Distrito is Iron Chef Jose Garces’ high-energy restaurant inspired by the spirited culture and cuisine of Mexico City. Bringing authentic flavors and ingredients from the Mediterranean to Philadelphia. The European-Style Cafe and Bar Garces Trading Company is a full-service bar and restaurant focused on Iron Chef Jose Garces’ own favorite dishes from his travels to cafes throughout Western Europe, with a focus on Italy, Spain and France. Private and semi-private rooms available in one of the city’s best sports bars. Since 1856 Friends Center has been a gathering place for community groups. With its LEED Platinum green renovation and modern video and teleconferencing facilities, it is historic and up to date. The premier gaming and entertainment complex in the Philadelphia area. The Liberty View Ballroom at the Independence Visitor Center is located in the heart of America’s Most Historic Square Mile. Provides a full range of amenities for meetings and conferences of 4 to 500 persons. Iron Chef Jose Garces’ seventh Philadelphia venture is a restaurant and bar serving the finest artisanal food and drink all sourced from the United States. Located adjacent to historic 30th Street Station. Multi-purpose 10,000-seat sports and entertainment venue. Gloriously restored historic sailing ship offering fine dining and private meeting rooms. Interactive Museum celebrating the US Constitution featuring interactive theaters, exhibits and artifacts. American Jewish history exhibition, education programs, tours, shop, facility rentals. Over 3,500 slots, electronic table games and live racing. You’re closer to winning than you think. Conference and meeting rooms, banquet halls, theatres, full A/V, catering at an Ivy League institution. The venue boasts a large floor and arena seating perfect for meetings or dinners, small rooms for break-out sessions, and private luxury spaces available for elegant affairs. 2,000 years of artistic expression with dedicated meeting space. Elegant mansion for your corporate meeting, wedding, bar mitzvah, social event. A spectacular view of Philadelphia from more than 500 feet up. Founded in 1830, this Roman Catholic church is located in the heart of Philadelphia. One of the world’s greatest collections of racing sports cars. Wonderful lunch, dinner and late-night cruises on the Delaware River. Great dining, entertainment and an outdoor, waterfront patio on the Delaware River. Italian Restaurant and dynamic off-site venue with cutting edge amenities. Private Country Club with banquet/meeting facilities and championship golf course. A historic landmark, the center’s elegant state-of-the-art interiors make the their various unique spaces compelling venues for concerts, dance, theater, recitals, film, lectures, symposia, corporate events, board meetings, graduations, community gatherings, personal celebrations, dinners and more. Phone: (610)-238-4580The ACE Club is a fully private country club with impeccable service, delicious cuisine and upscale amenities. Old world historic charm, beautifully restored, perfect for larger groups. Magnificent Georgian architecture; overlooking Independence Hall and the Delaware River. Deluxe meeting and reception facility in Center City Philadelphia. Inspiring meeting and event facilities at Philadelphia’s renowned Cira Centre. Historic private club in Center City for private parties and rentals. Once a world-renowned studio, this newly renovated, state of the art event space consists of an open rooftop area above a 4,000 sq. foot event space with lighting, stage, DJ booth and live streaming capabilities. Perfect for corporate meetings and cocktail/dining events. Tinto draws inspiration from the rich cultural and culinary traditions of Basque country, while inspiring, tantalizing and satisfying all who enter with extraordinary cuisine created by Iron Chef Jose Garces. Premier catering venue for meetings, events and weddings. A Philadelphia steakhouse, charcuterie and raw bar with grand architecture. Penn Museum offers unique space for all types of events. Celebratory dinners in the Engine House. Romantic evenings on the Riverside Veranda. Business lunches in the Breezeway. Ceremonies at the Gazebo. With its beautiful hardwood floors, fully functional serving area, amazing views of the Delaware River and the Philadelphia Skyline, you will be drawn to this amazing location Centered across from the Sugar House Casino. Serving lunch and dinner; live music seven days a week. Host your next conference, gala, reception, or other private event at this popular live music and dining location.